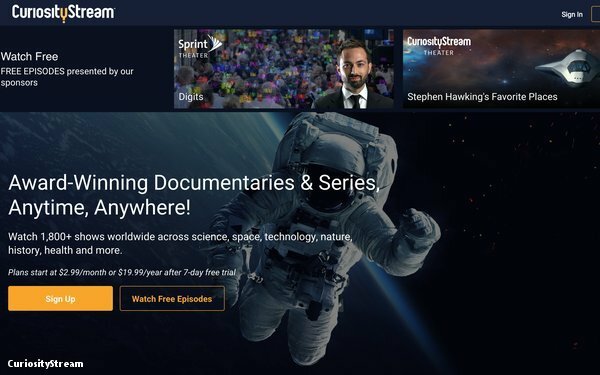 The streaming nonfiction video service CuriosityStream has significant expansion plans, and has raised $140 million in venture capital funding to pursue them. Blum Capital Ventures and TimesSquare Capital Management are among the new investors in the company, which was founded by John Hendricks, who founded Discovery Channel in 1982. The company says it intends to use the funding to boost its programming output and availability, improve its technological capabilities, and increase spend on global marketing. It intends to grow its content library by 50% this year, going from more than 2,000 titles to more than 3,000 by the end of 2019. CuriosityStream says that it passed the one million subscriber mark at the end of 2018, though it did not break out direct subscribers versus bundled subscribers. The service also includes sponsors who take over shows and verticals, though it does not use the same lengthy commercial pods and breaks that traditional linear TV uses. The company, which was founded in 2015, is an effort to launch a modern, digital-first, global, nonfiction video service, with both direct-to-consumer options, and availability in larger bundles. With the $140 million funding round, CuriosityStream now ranks among the most well-funded of all privately owned streaming video companies. For comparison, the streaming video bundle Philo has raised $83 million, according to Crunchbase, Pluto TV raised $52 million before selling to Viacom for $340 million, and Tubi TV has raised $26 million. In other words, CuriosityStream is now exceptionally well-funded to take its service global.